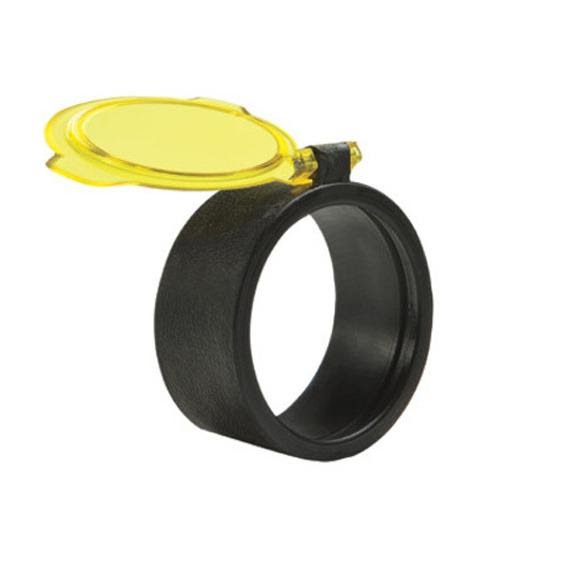 Quake's Bushwacker Optic Covers are designed to fit both ends of your scope (ocular and objective). Quake's five sizes fit the majority of all scopes, as well as a variety of binoculars, flashlights, smaller spotting scopes and other field optics. The stretchable covers fit securely and are easy to use. Quake &apos;s Bushwacker Optic Covers are designed to fit both ends of your scope (ocular and objective). Quake&apos;s five sizes fit the majority of all scopes, as well as a variety of binoculars, flashlights, smaller spotting scopes and other field optics. The stretchable covers fit securely and are easy to use. The NEW Bushwacker 270 degree See-Thru cover has a snap-lock lid preventing dust build up and moisture (rain and snow) accumulation. It is ideal for gathering light under low-light conditions, or for quick, close shooting situations. The Bushwacker 270 degree Matte Black is a non See-Thru cover, providing the same snap-lock protection as the Amber See-Thru model. The Matte Black lid is the perfect choice where rugged field use is a factor and low-light visibility is not important. With the new 270 degree range of motion, the cover will flip back and lay parallel to the scope so it doesn&apos;t block the shooter&apos;s line of sight when looking over the scope for target acquisition.